What is it about this Bag of Bones that makes it seem so frightening? We can’t quite put our finger on it. Maybe it’s the bones’ realistic sizes, or their lifelike molding that makes them seem as if they were taken from a real person. 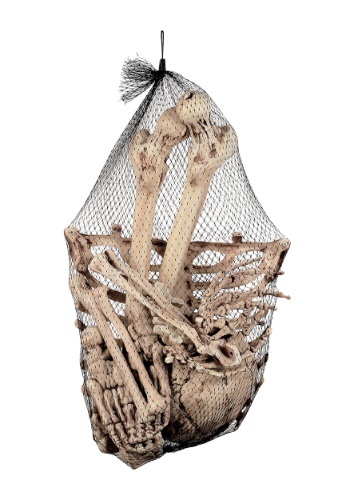 Either way, there’s something incredibly creepy about this Bag of Bones that makes most people freeze up in terror at the sight of them. If you’re a bit of a prankster like us, you’ll enjoy watching the creeped out reactions of trick or treaters (and their parents) as they walk up to your house on Halloween. Of course, if you’re feeling really diabolical, you could set this oversize bag of bones outside your house at any time of the year and watch the horrified looks as your neighbors and guests try to figure out if they’re real. No matter what time of year you choose, this sack of bones is guaranteed to creep out even the most hardened people in your community.